Raw Cool Neon EL Wire is sold by the foot at any length and requires a solder joint to glow. You can solder it yourself following our soldering instructions or order a Custom Solder Joint. If you'd like to get your Cool Neon ready to glow, look in Instant Gratification for pre-soldered wire in 5-, 10- and 20- foot lengths. Cool Neon wire is the highest quality EL wire available and comes with the BEST customer support. Spools of Cool Neon wire are available for purchase and ready for immediate shipping. Spool lengths vary depending on our inventory. High Bright 2.6mm and Hella Phat 5.0mm are commonly 328 or 492 feet; Angel Hair 1.2mm, Standard 2.3mm, and Phat 3.2mm are commonly 820 feet. Please contact us for pricing and availability at 510-547-5878 or info@coolneon.com. High Bright Standard (2.6mm) Cool Neon wire is about 150% brighter than Angel Hair (1.2mm), Standard (2.3mm), Phat (3.2mm), and Tail wire. Its High Bright core also makes it glow bright for almost twice as many hours of use (it retains half its brightness after about 3,000 hours). Curl it around your finger and it will hold its shape thanks to its thicker core. Highly recommended for solid surfaces or applications (e.g. hats, bikes, signs) that don't involve repeated bending like clothing does. Use indoors or out. 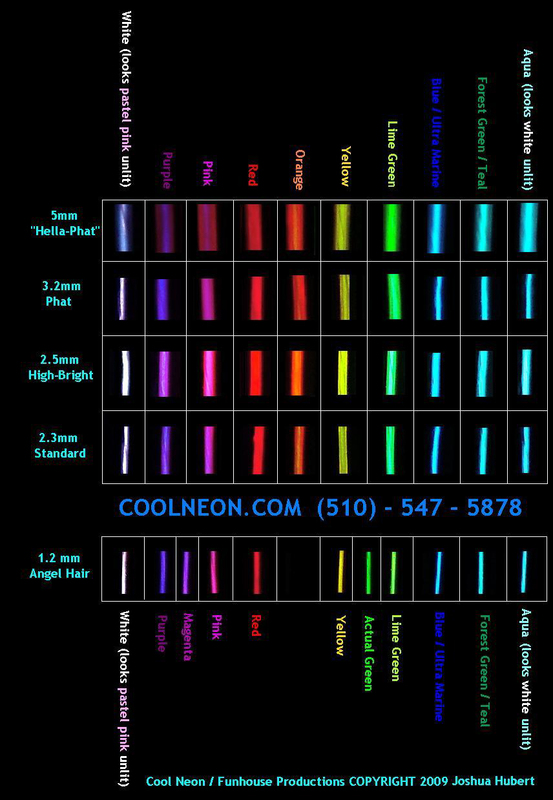 Angel Hair Cool Neon wire is our smallest diameter and great for detail work. It can bend over onto itself 180 degrees on a 1/8" radius. Without the PVC coating that protects our other Cool Neon wires, it's the most fragile and sensitive to sunlight. Angel Hair isn't recommended for outdoor use or clothing. Its durability and color is unmatched by any other small-diameter wire. VISIT HERE FOR OUR COLOR CHART. Cool Neon Wire is sold by the foot; ordering a quantity of 17 will ship a 17ft section of wire. Standard Cool Neon wire is 2.3mm in diameter and can bend around a pencil. The Standard core is supple, making it especially suitable for projects that need a thinner diameter that holds up well to repeated bending (like costumes). Good for indoor or outdoor use. Visit here for our Color Chart. Orange is especially beautiful in Standard. Aqua, Lime, Blue, Green, Orange, Yellow, and Pink are the only colors available in Standard until further notice. All of our Standard wire is the original Lytec brand made in Israel. Its durability and color is unmatched by any other wire of similar diameter. Phat Cool Neon wire is 3.2mm in diameter and can bend around a nickel. An extra coating makes it UV-protected and weatherproof, giving it the best durability outdoors. Its Standard core is supple and holds up better to repeated bending. We highly recommend its flexibility and thicker PVC for costumes. Good for indoor or outdoor use. Visit here for our Color Chart. Aqua, Pink, and Lime are the only colors available in Phat until further notice. All of our Phat wire is the original Lytec brand made in Israel. Its durability and color is unmatched by any other wire of similar diameter. Tail wire is a 3.2mm diameter Phat wire with a thin sheet of PVC (8mm wide and .5mm thick) running along its side. The tail is great for hammering or stapling onto surfaces or sewing into seams of fabric for costumes or upholstery. Visit here for our Color Chart. Tail wire is available in only Yellow, Pink, and Green until further notice. All of our Tail wire is the original Lytec brand made in Israel. Its durability and color is unmatched by any other wire of comparable dimensions. Waterproof Cool Neon wire (3.0mm) is great for enhancing your water-based projects, pool, hot-tub, or aquarium. While our other, PVC-based wires are water-resistant and may even work underwater, Waterproof Cool Neon wire is molecularly closed, ensuring total protection even when submerged. Waterproof wire is designed to be directly soldered to the Water Resistant Driver.